Viswajyothi is one among the CMI Institutions which were sprout from the great vision of St. Kuriakose Elias Chavara. He was born on 10th February 1805 at Kainakary, Kerala. At the age of five he began his studies in a ‘Kalari’, a village school. When he was 13, he joined the seminary at Pallipuram for his priestly training. While he was in the seminary, his parents and his eldest brother died of an epidemic. On 29 November 1829, he became a priest. 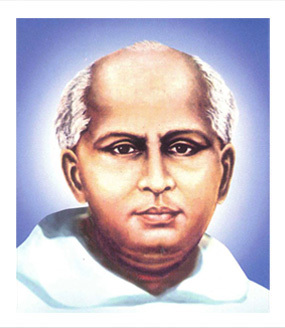 St. Chavara was instrumental in founding two Catholic Religious Congregations – one for men, Carmelites of Mary Immaculate (CMI), and the other for women, Congregation of Mother of Carmel (CMC), for the spiritual renewal and all round development of the society. Starting seven ashrams and a convent in different parts of Kerala, St. Chavara initiated a spiritual movement among the people of Kerala. He established the first Catholic Sanskrit School, a major seminary and a printing & publishing house at Mannanam. He directed that every church should start a school attached to it where children, even from the poorer sections, come to learn. The children were encouraged to come to the school by supplying midday meal and dress for them. He founded a ‘Home of Charity’ to take care of the destitute, the beggars, the ignored sick and the old. He also organized the first voluntary charitable association in Kerala for self-help among the needy. He was well versed in seven languages – Malayalam, Tamil, Sanskrit, Syriac, Latin, Italian and Portuguese. Even in the midst of such manifold activities, he found time to write several literary and spiritual books in prose as well as verse. Among them, ‘Anastasia’s Martyrdom’ is the first narrative poem and ‘Nalagamangal’ the first chronicle of history in Malayalam. St. Chavara was a man of prayer and great charity. He lived for 65 years and died on 3rd January 1871. His sanctity was officially recognized by the Church, when Pope John Paul II declared him ‘Blessed’ on 08 February 1986. St. Chavara is the heavenly patron of all CMI and CMC institutions. Let us pray to him to intercede before God for all our needs, especially for success in our studies. The Carmelites of Mary Immaculate (CMI), right from its beginning in 1831, found education as one of the principal avenues of their apostolate, and considered an educational institution a second home having close collaboration with the families of the students. The CMI Congregation today carries out its educational mission through many good arts and science colleges, technical institutions and a number of aided and unaided schools at all levels in different parts of India. CMI Vision of Education is to form leaders who are intellectually competent, spiritually mature, morally upright, psychologically integrated, physically healthy and socially acceptable, who will champion the cause of justice, love, truth and peace and who are ever open to further growth.